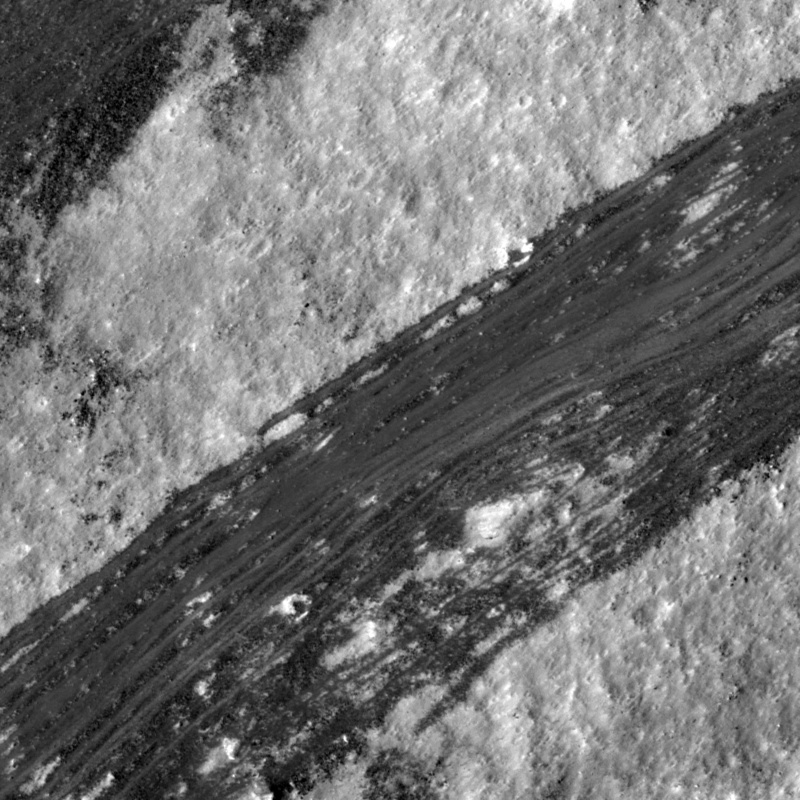 Sometimes flows of material on the Moon are made of light-colored material, sometimes they’re made of dark-colored material. This is definitely an example of the latter! This is a small portion of a Narrow-Angle Camera image taken by the Lunar Reconnaissance Orbiter, showing detail of “low-reflectance” granular material sliding down the wall of a crater located on the far side of the Moon. It’s assumed that these streaks are a result of a dry process rather than molten because there’s no visible melt near the crater’s rim (towards the upper right) but there is melt on the floor of the crater. (“Melt” is the term for solidified lunar lava created as the result of a meteorite hit.) Granular dry flows can mimic the appearance of “wet” flows very closely, so often with images like this researchers must look around the surrounding area for more clues to the likely creation of features. The crater is described as “Copernican” because its relatively young age (less than 1.1 billion years old) is close to that of the more well-known and visible crater Copernicus on the Moon’s near side. See this image on the LROC website here.